HALLWAY Front aspect obscure window, wall lights, dado rail, textured ceiling, stairs to 1st floor, under stairs storage cupboard housing gas meter, electric meter and fuse box. Doors to rooms. LOUNGE: 14' 3" x 11' 8" (4.34m x 3.56m) Front aspect double glazed bay window, two wall mounted radiators, feature fireplace and surround, coved and textured ceiling. SHOWER ROOM: 10' 4" x 4' 7" (3.16m x 1.40m) Walk in shower cubicle with electric shower, low level WC, wash hand basin, towel radiator, part tiled, fan, coved and textured ceiling. STUDY: 9' 3" x 6' 6" (2.82m x 1.98m) Rear aspect double glazed window, wall mounted radiator, built in cupboard, coved and textured ceiling. DINING ROOM: 13' 3" x 10' 9" (4.04m x 3.28m) Two side aspect double glazed windows, wall mounted radiator, textured ceiling. KITCHEN: 11' 2" x 11' 1" (3.4m x 3.38m) Rear aspect double glazed window, side aspect double glazed obscure window and door, wall mounted boiler, range of wall and base units with work surfaces over, 1 1/2 inset sink and drainer, built in hob with hood over, built in eye level oven, plumbing for washing machine, tiled floor. 1ST FLOOR LANDING: Wall mounted radiator, side aspect double glazed door, stairs to 2nd floor, doors to all rooms. BEDROOM: 14' 8" x 11' 3" (4.47m x 3.43m) Front aspect double glazed bay window, wall mounted radiator, feature fireplace, coved and textured ceiling. BEDROOM: 11' 3" x 8' 10" (3.43m x 2.69m) Rear aspect double glazed window, wall mounted radiator, coved and textured ceiling. BEDROOM: 10' 2" x 8' 1" (3.1m x 2.46m) Side aspect double glazed window, wall mounted radiator, built in wardrobe, textured ceiling. 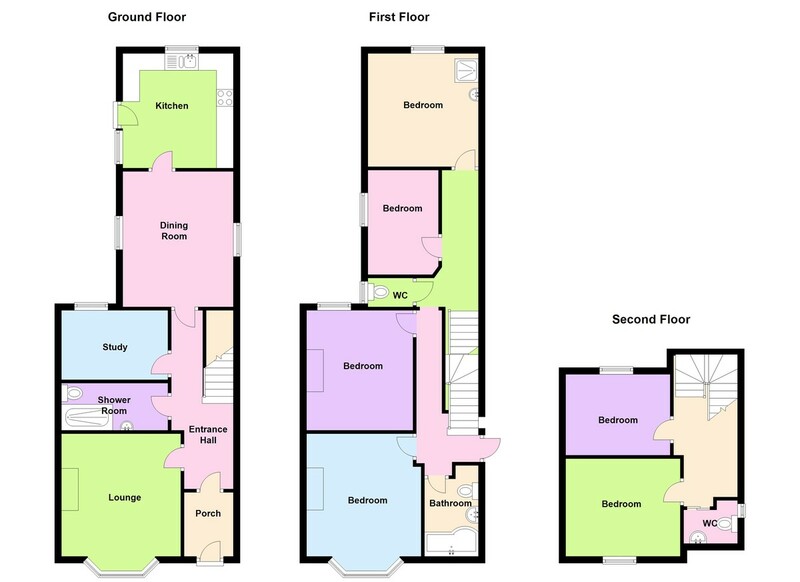 BEDROOM: 11' 2" x 11' 1" (3.4m x 3.38m) Rear aspect double glazed window, wall mounted radiator, shower cubicle with electric shower, wash hand basin, part tiled, built in wardrobe, coved and textured ceiling. BATHROOM: Side aspect double glazed obscure window, fully tiled, panel bath with electric shower over, wash hand basin, low level WC, storage cupboard, towel radiator. BEDROOM: 11' 5" x 10' 8" (3.48m x 3.25m) Front aspect double glazed window, wall mounted radiator, built in cupboard. BEDROOM: 9' 4" x 7' 11" (2.84m x 2.41m) Rear aspect double glazed window, wall mounted radiator, eaves storage. WC: Side aspect double glazed obscure window, low level WC, wash hand basin. OUTSIDE FRONT: Hardstanding for parking, access at side to rear.